Whatever the reason might be for someone to use crutches, be it a minor accident, recovery or a chronic affection, there is no room for compromise. A good pair or crutches is essential since they will be used on a daily basis and they need to support the weight of the person using them. Crutches may be of different types but there are 2 main ones that are used more often. Usually, people go for forearm crutches, also known as elbow crutches or axial crutches that are also referred to as underarm crutches. Both of them have their own advantages and disadvantages which will be discussed later on. 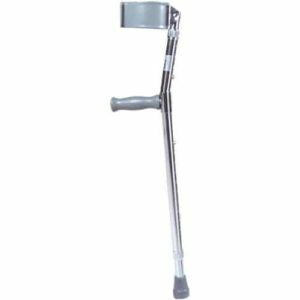 For the moment, we will go through 10 different crutches that either offers a good deal for the money or are superior in terms of sturdiness, comfort or build quality. To keep things short, here is our selection of the top 10 best crutches in 2019. Millennial Medical Short In-Motion forearm crutch is a simple and reliable product. With an ergonomic design, the crutch manages to be comfortable to use even for extended periods of time making it suitable for the ones that are dealing with severe mobility problems. The crutch set is considered to have a heavy duty construction. It supports loads of up to 350 pounds which is more than enough. The molded cuffs are flexible and comfortable enough while the ergonomic handles offer a good grip. As far as the ergonomics go, the crutches have articulating tips. It also has an angled design from the handle which helps it stay out of the way when walking. The model also has springs to assist with movement. ORTONYX walking forearm crutches are surprisingly inexpensive for the quality they offer. They are simple, ergonomic and quite well build. According to the specifications, the crutches can support a maximum user weight of 308 pounds which is quite remarkable. The handles are made out of a bi-injected polymer that feels soft to the touch and provides decent grip. They also feel sturdy and manage to offer quite decent support. One feature that will prove to be useful is the fact that the height is adjustable. Also, they have anti-noise tips with a rubberized surface that prevents them from slipping. The total weight of the crutches is just 1.15 pounds per crutch making them quite lightweight and easy to use. DonJoy Rebound ergonomic crutches were made to be simple, practical and comfortable to use. The crutches use stainless steel to improve durability yet still manage to be lightweight. 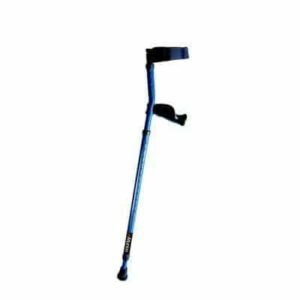 Like most other crutches, they have rubber-coated handles that are soft to the touch but sturdy and durable. Their underarm cradle is also covered with a soft rubber material to reduce irritation and soreness. The tips of the crutch can absorb some impact as they are spring loaded and have a rubberized coating. The rubberized coating also prevents the crutches from slipping on flat or wet surfaces. 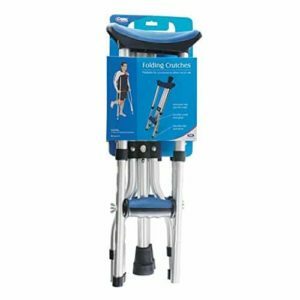 Carex folding crutches managed to be both affordable and practical at the same time. 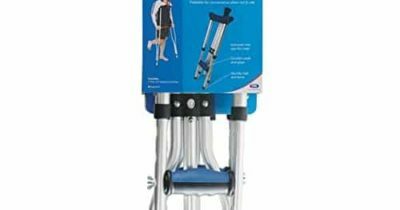 Despite being cheaper than most other crutches, it can support a good amount of weight and very easy to store due to its folding design. Being an underarm pair of crutches, comfort can be an issue. The crutches do have foam padding that will help reduce soreness but like most other crutches, it can be a bit difficult to use them for extended periods of time. In terms of functionality, the handles have a soft rubber coating. The tips are also made from rubber to prevent them from slipping on various types of surfaces. Also, their maximum weight limit is 250 pounds which should be decent enough for the vast majority of people. Mobilges universal crutches are exactly what their name states. 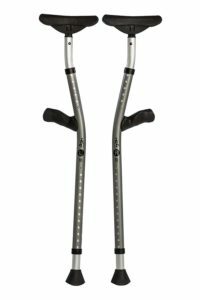 They are classic crutches with the design everyone is familiar with. They are also not that expensive and quite practical as they are lightweight and rather comfortable to use but not for extended periods of time. The saddle is made with a cushioned surface that reduces irritation, pain, and soreness that may occur when using crutches. It also has rubber coated tips to prevent them from slipping. As far as the handles go, they are covered with a soft plastic material. Construction is quite decent. The crutches are made from lightweight steel and feel quite sturdy. Also, the height of the crutches can be adjusted in order to ensure that they fit properly. Drive Medical is a brand that most people trust because of the quality of their products. The forearm crutches they offer are quite inexpensive but do not feel cheap. They are made from stainless steel and can support a maximum weight capacity of 300 pounds. For the handles, the manufacturers used vinyl which should be comfortable enough to hold with a tight grip. The height of the crutches can be adjusted and ranges from 28 to 37 inches. As far as safety goes, the cuffs are contoured around the shape of the arm so that they fit comfortably and provide stability. The tips are extra large which also contribute to an improved stability. Drive Medical Euro style forearm crutches offer great value for the money. They are very inexpensive but practical and sturdy. They were made to handle up to 300 pounds in terms of maximum user weight, which is much more than what other crutches can deal with. The Drive Medical crutches are made from lightweight aluminum. The grip and the cuff are both one piece and are made of a molded plastic. It offers a good grip and will not slip from the hand. For the tips, the manufacturers used a soft plastic that prevents them from slipping. As for size, the crutches can have their height adjusted and ranges from 29 to 38 inches. The recommended user height can be anywhere between 60 and 74 inches. Mobi Mobilegs crutches are a good pick for the ones that are in need of some aid to move around. It is well made and because of its design, it is comfortable and lightweight. The crutches do feel premium, and this is also reflected in the price tag. Like most other crutches, they are made out of metal with rubber handles and special design for the saddle. The saddle has a perforated design which helps it reduce the heating sensation and makes it feel more comfortable. As far as stability and control go, the feet maintain a firm contact on the ground as they have a rubber coating that also absorbs some shocks and impacts. The crutches are reasonably lightweight and can support loads of up to 300 pounds. 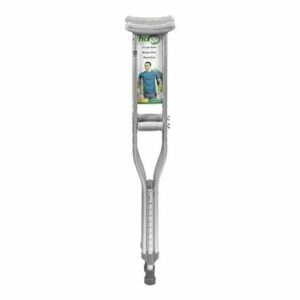 The Medline crutches offer a great value for the money. Besides being inexpensive, the crutches were made to be functional, comfortable and provide great support. To make them durable, the crutches use stainless steel to help them support a weight capacity of up to 250 pounds. The height of the crutches is adjustable and can range from 60 to 74 inches. Using the crutches for longer periods of time is possible as they are quite comfortable. The arm cuffs have a soft vinyl coating. The handles are covered with a soft rubber that helps improve grip. As for the tips, they are also made using a rubber material that prevents the crutches from slipping. 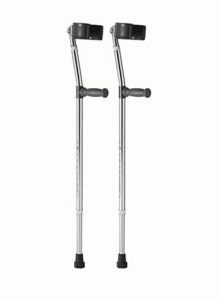 Hugo Mobility aluminum crutches have been a very popular pick mainly for their low-price tag and the quality they offer. 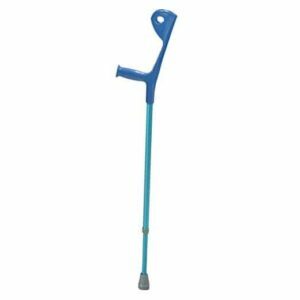 The crutches have a very simple design, and many will recognize that they are the same type of crutches that almost everyone else is using. The crutches are made out of aluminum to keep their weight low. Height is adjustable and can go from 5′ 2″ to 5′ 10″ with just the push of a button. Even if they are made out of aluminum, the crutches can support a maximum weight capacity of 300 pounds. In terms of comfort and ease of use, the crutches have cushioned underarm pads. The handles are also covered with a soft material. 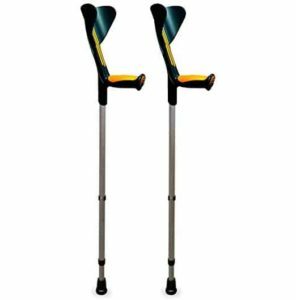 As for the tips, they are covered with a soft rubber material that improves stability and prevents the crutches from slipping. Picking crutches can be quite complicated. The trouble comes from the fact that they need to be used frequently and even for long periods of time thus some aspects cannot be overlooked. Even if a pair of crutches may have great feedback from users, they will not work for everyone. For many reasons, there are multiple models of crutches so that everyone can find a model they can walk with. Before rushing to buy a pair or crutches, it is important to have a few things cleared up to avoid having to return them. Height: Most crutches have an adjustable height with a locking mechanism. They are not all the same as some and some models may be taller than others. Most manufacturers clearly state the height of their crutches. Underarm or forearm crutches: Usually, the forearm ones are more comfortable but not everyone can use them properly. Underarm crutches are usually a bit easier to use. Maximum weight capacity: The maximum supported weight capacity can vary a bit depending on the model. Some crutches cannot sustain the weight of a user that goes beyond 200 pounds while others can support as much as 350 pounds. This is an information that needs to be clearly disclosed by the manufacturers. A good pair of crutches needs to be comfortable with anything else. If they are the right size and they have some sort of cushioning or soft contact surfaces, crutches should be good enough to use without causing soreness or pain. Pricing is not that important. Even a cheap pair of crutches can be good enough. In fact, a lot of the models in our list are inexpensive but comfortable, lightweight and durable. As long as the crutches are tall enough, and have some sort of padding or soft materials for the handles, the crutches should be good enough.